Today, antivirus occupies an important place. And antiviruses have their own characteristics in work. That is, there is some kind of server where the developers are manipulated. There are endpoints where updates come from the center. But if the threat is absolutely new, then it will take a lot of time to react to it. And sometimes it is critical. It may be the work of the company or even a few. What about deadlines. And what if this company or network is engaged in work in the energy sector and as a result of the attack, entire areas or cities may be de-energized. I think that you calmly recall a couple dozen examples of similar incidents over the past few years. What does it mean? The current anti-virus protection system is absolutely outdated! It does not meet the requirement of today, does not protect properly. In fact, hackers are now very easy to hack anything. Now let's imagine if we combine the blockchain and artificial intelligence in the fight against new challenges. That's exactly what the Novam anti-virus platform is going to do, which will act as a human body. You react to new viruses, adapt your immune system. Why not move such a scheme of work to antivirus engine. Blockchain and AI can today allow you to create a completely new level of anti-virus protection. Just imagine that the core of the Novam platform is decentralized. There is no single center for striking. 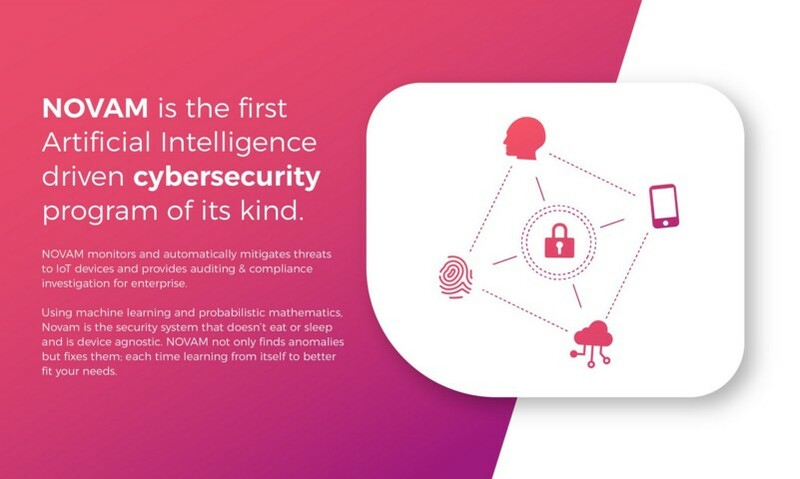 All are controlled by AI, which collects information from the end points - Novam clients, and at the same time protects them from new threats. Predicts the risks and acts so quickly that the human factor against this is simply powerless. Novam platform tokens will be used both to pay for the client and to encourage the work of these clients. Stay online regularly and give more information to Novam than others - get your bonuses. DAG technology allows you to run master nodes on the network. Hence the decentralization of the platform. In fact, a hacker, in order to strike a platform, will have to simultaneously strike hundreds and thousands of points in the system. This is physically impossible, since there are still blockchain technologies, which themselves represent a whole array of security. Antivirus in the blockchain using AI is not a new idea. But on the side of Novam there is a small and real budget of the project. There is a detailed WhitePaper, where all technical aspects of the future platform are laid out on the shelves. When programmers get down to business, everything looks that way. Well, here we need, above all, technical success. Those technologies and the concept that are used in Novam can permanently push the problem of cyber security to the background. Absolutely for everyone! So I believe - Novam is on the right track! The private sale starts on December 10th, so there is still time to study everything and make the right decision. Feel free to register for our whitelist here.